Not sure how this all turned out. One can only hope rider Ross McMillan recovered. Better race report in the next installment. Getting stuff scanned over the past year or so in before this year ends: Milton Blewitt, Bunny Jeboult, Loch Madill and Ray Ordano winning races at Hatzic Lake and Gary Beck winning a race at Mission Raceway over local Pete Reimer. Two profiles of Langley Speedway drivers when they travelled to Grandview Bowl in 1966: Len Jones and Ron Lamont. Here's a couple photo albums from Photobucket that contain some Canadian, if not B.C., content. Drag racing and custom cars from Alberta with some out of province cars like Jack Williams' Syndicate Scuderia. And a foray to the south (California, it appears), all during the 1962-1967 era. So it's Boxing Day. A string of videos uploaded to YouTube on the End of Empire display at the Trev Deeley Exhibition. They're short but there's about nine of them. I'll embed the first three. Yes, Yes, Merry Christmas. Enjoy it. From the Golden Wheels midget CD of photos. Ernie Spalding was a Canadian by birth. Lived and raced out of the U.S. Came to Canada to race midgets on the lower mainland and big cars in Victoria before and after the Second World War. Just to prove that here's a Victoria clipping from 1949. Oh yeah, his son was Cliff Spalding who won a few USAC midget races over the years. And Ernie's brother was Jack Spalding who raced midgets in Vancouver and big cars in Victoria. There was a report of an air race, a relay race, at Chilliwack airport in 1954. Here's an ad for another race in 1955. Chilliwack report three for 1955. Power boat racing. Some interesting names in Jim Hutchison as he is in the BC Sports Hall of Fame and a Greater Vancouver Motorsport Pioneer. Bob Henry must be the same Bob Henry that raced midgets at Digney Speedway and further south into Seattle. And, if he is the same person, the guy who started Van-Kam Trucks. The results of the 1955 BC Motorcycle Championships at the Chilliwack fairgrounds. Big action. Big report. Continuing with some more Chilliwack stuff from the 1950s. AMA motorcycle races being promoted at the fairgrounds for Dominion Day. Okay, going deep into the memory banks for this one. Uh, Gumby (dammit!). And now for something completely different: air races. A relay race held at the Chilliwack airport by a local flying club as part of a show. Probably not the first race like this held in B.C. but they were never well advertised, or part of another show as this one was. The second motorcycle race at the Chilliwack fairgrounds on Labour Day of 1954. All the big names from the U.S. and Canada, including Trev Deeley and Eugene Thiessen. Hydroplanes being built in the Chilliwack area. With Cultus, Harrison, Hatzic and other bodies of water nearby it was a natural for the locals. Moving onto 1954 in Chilliwack, the first of two known motorcycle races held on the fairgrounds' half mile horse track. This one from the July 1st Cherry Festival event. Another interesting find from Chilliwack in 1953. I hadn't heard of this guy's name before: Charlie Kobus. A quick look at the web finds a little more. Art Maynard, Long Beach, Calif., won the Limited Class hydroplane race yesterday afernoon while he was unconscious from the waters of Lake Washington by another racing driver who sacrificed his own chances of winning to make the rescue. Eddie Meyer, Hollywood,Calif. driver of the Avenger IV, was the hero who rescued Maynard. Maynard was not seriously hurt, but was taken by ambulance to a hospital for a checkup. He was thrown into the lake when his speeding boat, the Dollar Bill, event out of control and flipped over. Meyer held him up until a Coast Guard patrol boat pulled him out Maynard torn to shreds in the crash. Maynard won the Seattle Seafair Trophy on the basis of his victory in the first of the two heats. He had tied with Charles Kobus, Vancouver, B. C., at 400 points for a heat victory apiece, but his speed of 83 miles an hour bettered Kobus' second heat-winning time of about 75 miles per hour for the 7 miles. Maynard was going at high speed near the front of the field, when his craft's prow apparently lifted too high off the water and wavered to disaster. The Dollar Bill was wrecked. John D. Beverly of Spokane Seed third in his Lettuce Go with 320 points. the $4,000 Trophy, originally offered for Gold Cup class boats, by virtue of his faster time. Maynard's time for the first heat was 5 minutes 27.19 seconds. Kobus did 6:03.21 in the second heat. While looking for something else I found a few things that happened in Chilliwack I didn't know happened. That's usually the way with my research. This one a thrill show, always a crowd drawing event. Something put up recently after Herb McNutt's passing. Many photos of the old Arlington drag strip as well as a nostalgia rail he worked on. Some cackling. Looks like plenty of smiles and laughs with friends like Jack Williams and others. Here's a link to some footage of Herb McNutt being interviewed up in Sechelt, BC. Also Herb's obituary is here. Here's a couple things from 1967. An ad from the Vancouver Sun and a report from Motorsport in B.C. Another ad from the Everett Herald. Probably a Rich Carlson photo. Here's the result as reported in the Everett Herald back in 1964 for the previously posted ad and pre-race hoopla. Big California racers came up like Weekly-Rivera-Fox-Holding, aka the "Frantic Four". Here's a link to their historic website: Frantic 4 Racing History. Of course it's good to see that Jerry "the King" Ruth won the event to hold up the honour of the Pacific northwest. Herb McNutt, track manager at the Arlington (WA) drag strip, recently passed away. It was the track in the northwest for a while. At least, the one that B.C. guys (and girls) would head to if they couldn't get further south. I'll spend a couple days getting some Arlington stuff up here. I can see Brian Thompson with his Hudson no. 4 early-late moving around the track. One hot car back then in the late 1960s. Also George Cook's no. 12 super stock. Harry Roberts emailed a couple notes to me yesterday. They can be found in the comments here. Points out a spelling mistake the newspapers of the day made and I continued to make. So changes made here and here to correct the name. And a couple photos of Harry and his early-late from 1967 from the BCTRA yearbook. I know I've seen photos the modified he drove a few years later at the Langley Speedway Historical Society displays but can't seem to find a photo of it in my files. And even more coverage of Langley from the Columbian in the 1980s. Thanks a lot to the old Columbian newspaper. It definitely covered motorsports when other newspapers covered tiddlywinks. A profile of Bob Fox for a special open competition race held at Langley. More Langley stuff from the 1980s. Stuff I scanned for some presentation material but haven't put up here yet. And if I wait for the chronological look at Langley (which I haven't forgot about) for these things to get plugged in, well we're in for a long wait! Lots of extra clippings about Eldon Rasmussen, former CAMRA racer from Edmonton, Indy 500 racer and Canadian Motorsport Hall of Famer. Been real lax here. Time to get some more done. Tom Sneva from 1975. He got under Eldon Rasmussen of Edmonton and then Sneva ended up hard into the wall. Sir Jackie Stewart accesses no blame to either driver. Seems like a proper call from the video evidence. Tom was on the pole three times at Indy in his career and went on to win the Indy 500 in 1983. The "Gas Man". Another clip about 2008 GVMPS Pioneer Ted Havens. I see the name Fred Herzog at the bottom of the story finishing third in a race. Same Herzog that is the photographer? He took photos of motorcycle scrambles at the north end of the 2nd Narrows Bridge. From a 1995 race report in the Harrison-Agassiz Observer. From the "wayback" machine. An ad for Terrible Teddy Tetzlaff and the Blitzen Benz at Minoru Park in 1914. More photos of Allen. These are midget shots from the Pacific northwest, mainly Aurora Stadium Speedway north of Seattle. 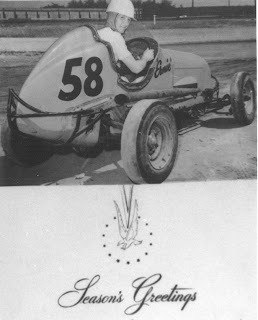 Allen also raced at Langford Speedway, Con Jones Speedway and Cloverdale fairgrounds. The flagger is Glen Shaw with the Gilmore Lion checkered flag. The midget was a Kurtis, owned by Tom Carstens, also known for his power boat and sports car exploits.